Potatoes are a popular veggie, but they're kind of a pain to prep. Peeling potatoes ahead of time is a major convenience if you want to cook them after you get home exhausted from work or if you're making a lot of food for a big meal or party. The only problem is that peeled and cut potatoes start turning an off-putting grayish, brownish or pinkish color in a matter of minutes. Don't despair! There's an easy remedy that lets you peel and pre-cut potatoes up to 24 hours in advance of cooking them – without experiencing this undesirable discoloration. What's Up With That Discoloration, Anyway? Why do potatoes develop funky hues shortly after you peel and cut them? It's not uncommon for produce to discolor once you remove its protective skin or cut into it. Surely you've seen apples, bananas or avocados quickly start turning brown after you peel or slice them. It's unappetizing, but it doesn't affect the taste, nor is it unsafe to eat. The process is called enzymatic browning, a chemical reaction occurring when certain phenols in fruit and veggies react with oxygen after exposure to the air. When a vegetable peeler or knife cuts into a potato, it damages the tuber's cell walls, triggering this reaction. There's no way to prevent discoloration without cooking the potatoes. But you can significantly slow it down. The best way to store peeled potatoes overnight – or for any period up to 24 hours – is in the refrigerator, submerged in water in a covered bowl or container. Simply wrapping them or sealing them in a baggie or container won't do the trick. This water method works for whole or pre-cut peeled potatoes. Fully cover the potatoes with at least an extra inch or two of water. Also, stir in 1 teaspoon of lemon juice or white wine vinegar per 5 cups of water, as the acid further inhibits enzymatic browning. Cover the bowl with plastic wrap or put the lid on the container and put the potatoes in the fridge. 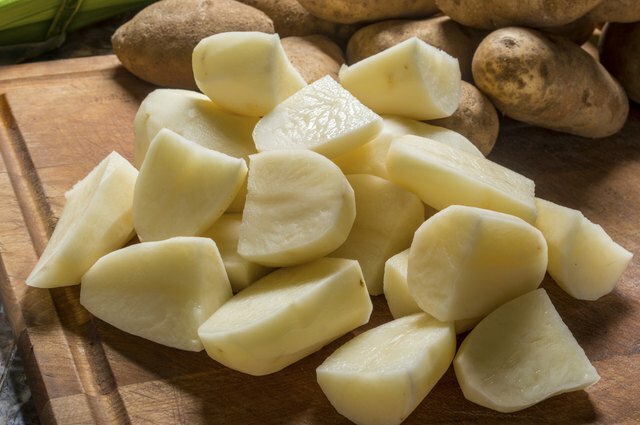 When peeling potatoes ahead of time, don't soak them for more than 24 hours at most, or they'll get too waterlogged and end up mushy after cooking. Even unpeeled, uncut potatoes are notoriously fussy about their storage conditions. Raw potatoes often only last about a week, maybe two under decent storage conditions. However, under ideal storage conditions, they might hold up for a month or a little longer. Keep potatoes in a cool, dry, dark place. 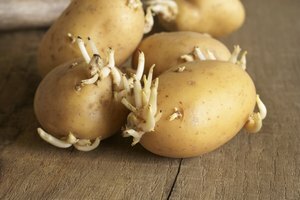 Don't refrigerate raw potatoes; it's too cold and moist in the fridge, which accelerates sprouting and rotting. The ideal storage temperature is between 43 and 50 degrees Fahrenheit (warmer than the fridge but cooler than room temperature). A basement, cellar, garage or shed is a good storage location if it stays in this temperature range (or even over 50 degrees but cooler than the rest of your home) and it's not humid. Storing potatoes in an appropriately cool environment better preserves their vitamin C content. 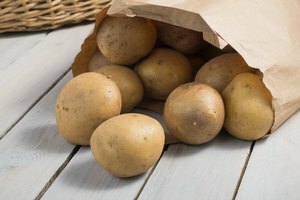 Don't store potatoes in a sealed bag or container; they need to breathe to prevent moisture accumulation, which leads to mold and bacteria growth and faster spoilage. Don't wash potatoes until you're using them, because again, moisture is your enemy during storage. Potatoes exposed to sunlight or fluorescent light during storage produce chlorophyll and start turning green. Sunlight exposure can also trigger production of a bitter-tasting, potentially toxic compound called solanine. – and not for the better (cooked potatoes fare well in the freezer for up to a year, though). 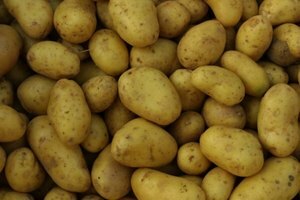 Store potatoes away from other produce, as many fruit and vegetables give off ethylene gas while ripening, and this can bring on rotting faster in potatoes. It's time to toss potatoes if they're sprouting, no longer firm, developing soft spots, becoming discolored or have mold growth. Healthline: What's the Best Way to Store Potatoes? 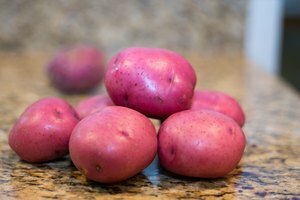 Kitchn: Food Science - Why Do Peeled Potatoes Turn Pink?